If you’ve gone camping at least once and or twice and experienced the nightmare of a sleepless night due to being cold, then you understand the importance of a warm sleeping bag. Actually, the sleeping bag is the most essential piece of camping gear. We are not talking only about the warmth. When we talk about the sleeping bag, we talk about the comfort, size, waterproofness, safety, and usability. Not the least important factor is also the price of a sleeping bag. In this article, I will cover all these factors and make sure you have enough information on how to choose the best sleeping bag. Remember that your sleeping bag will be one of the heaviest items on your hiking trip (besides the tent, sleeping mat, and the backpack). Therefore you need to make sure the sleeping bag is not too heavy. The weight, though, is not the only factor you have to focus on when choosing a sleeping bag. You also have to consider the warmth, comfort and usability or functionality. There are many sleeping bags on the market these days and you may get confused which one to choose – the mummy style sleeping bag, double sleeping bag or a quilt. I have prepared this guide for sleeping bag buyers, which I recommend reading. It will guide you through all the nuances of sleeping bags and help you see the big picture in order to choose the best sleeping bag for you. Now, let’s see which sleeping bags are considered the best on the market at the moment. It is one of the warmest and lightweight sleeping bags on the market. The bag has a full-length #5 YKK zipper which is convenient to have in a mummy-shaped sleeping bag. The bag has a draft tube construction which helps to hold the heat inside. Bags design in simple but efficient. Its slim-fit form makes it efficient because you don’t use your body heat to warm up the air inside the bag. The only thing which may hold you back from buying this sleeping bag might be the price. It is quite high compared to other bags on the market. But if you are a frequent camper and value the quality and reliability, the price most likely will not scare you off. 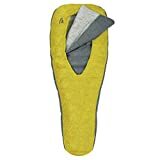 You probably already know that sleeping bags with synthetic fill are usually heavier than the ones with down fill. 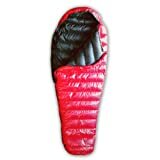 This sleeping bag is one of the lightest and most compressible sleeping bags with synthetic fill out there. It is also one of the most affordable. The designers of the bag have come up with a brilliant idea of welding the shell to the insulation. This way bag doesn’t have cold spots (like in those bags which are stitched through the insulation). The only con of this sleeping bag might be its half-zip. It may cause a bit of frustration for those who don’t like having their feet tucked in. Otherwise, this is a great bag. This sleeping bag is super lightweight. One of the best options to consider for backpackers. The downside is sewn-through baffles on the lower part of the sleeping bag. Sewn-through baffles create cold spots making the bag not suitable for chilly trips, even though it is 35° F (2° C) rated. Another downside is that this sleeping bag has only 1/3 zipper, which makes the sleeping bag less versatile. The Sea to Summit Spark Sp II 35 sleeping bag is recommended for those who camp mostly in warm weather. 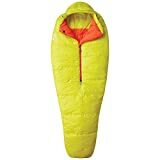 The unique form of the sleeping bag allows more freedom of movement for your feet and torso. The stretch-stitching technology allows even more flexibility – you will not feel restrained in the sleeping bag anymore. 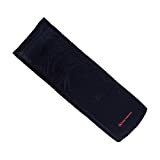 The bag also features water-resistant DownTek down which is really cool, having in mind that other down-filled sleeping bags cause trouble when becoming wet. The price of the Nemo Salsa 30 sleeping bag is above average, but it is definitely worth it. Zipperless design. Yes, zipperless. You may think “what the heck”, but, in reality, the bag is so comfortable, you may not want to look at other bags. Plus, lack of zippers reduces the weight of the sleeping bag and saves you from zipper-related warranty issues. Sierra Designs Backcountry Bed Elite 850F is truly unique. 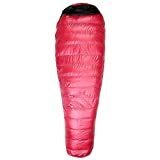 It has an integrated insulated comforter, which you don’t find in traditional sleeping bags. The comforter allows you to wrap naturally to your favorite sleeping position and adjust to varying temperatures. This sleeping bag is more comfortable than traditional mummy sleeping bags – it is wider at the shoulders, so you won’t feel restrained while sleeping. The price tag of Sierra Designs Backcountry Bed Elite 850F sleeping bag is above the average, but, as everything of extra high quality, it is worth every penny. A great choice for the warm time of a year. 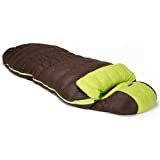 This 2-season sleeping bag performs well in warm conditions giving you the comfort you need after a day of hiking or other outdoor activities. Even though the bag is intended to be used on warmer nights, you can “upgrade” it by combining it with a sleeping bag liner. And there is a good reason for that – the interior loops will help you lock the liner down and keep it in place. A semi-rectangular form of the bag gives you plenty of space. If you are fed up by being restrained in a mummy-shaped sleeping bag, this one might be your option. One of the main reasons this Therm-a-Rest Corus HD Quilt included in this list is that it has state-of-the-art sleeping pad attachment systems. Check out the video above. It is so convenient that once you try it, I doubt you will look for other quilts. This is a 3-season quilt. It has enough room inside for turning and tossing during the night. The space inside of the bag also allows you to put on enough clothes (if needed) when sleeping on chilly nights. A surprisingly lightweight quilt for your summer camping trips. 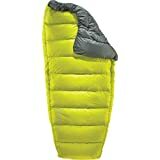 The Big Agnes Kings Canyon UL 45F quilt has no insulated bottom. It was done by the manufacturer in order to reduce the weight of the quilt. Anyway, the insulation on the bottom of the quilt gets compressed when you sleep and becomes less and less efficient. No worries, though, the sleeping pad will provide the insulation. The quilt has a full-length sleeping pad sleeve which gives you the guarantee that the sleeping pad stays in place at night. We believe, this article gave you some valuable and actionable tips and now you have all the necessary data to make up your mind.